Minimal change disease is also known as lipoid nephrosis. 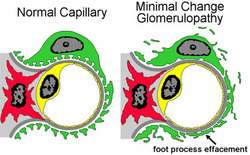 Minimal change disease may present with fusion of the epithelial foot processes and accumulation of the lipid in the renal tubular cells. Minimal change disease is associated with hypersensitivity reaction, following viral upper respiratory tract infection and Hodgkin disease. Minimal change disease is associated with nephrotic syndrome. Nephrotic syndrome is characterized by hyperlipidemia, edema, proteinuria and hypoalbuminemia. Minimal change disease typically affecting children. The treatment of minimal change disease will be focusing on prednisolone therapy. If the patient is resistance to steroid the treatment will focus on chlorambucil or cyclophosphamide. 1.Shalhoub, RobertJ. "Pathogenesis of lipoid nephrosis: a disorder of T-cell function." The Lancet 304.7880 (1974): 556-560. 2.BECKER, DANIEL J. "Minimal Change Disease." NEPHROLOGY Rounds 6.8 (2008).